Google Keep finally comes to iOS. Google today announce the availability of its note-taking app Keep for iOS users. Google Keep is a free way to save your thoughts. You can create, share, and collaborate on notes and lists. 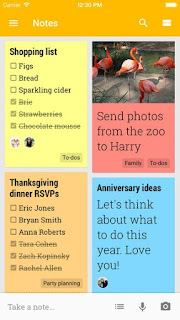 Quickly create, access and organize notes, lists and photos with Google Keep. All your notes are automatically stored in Drive. Quickly capture what's on your mind and get a reminder later at the right place or time. Speak a voice memo on the go and have it automatically transcribed. Grab a photo of a poster, receipt or document and easily organize or find it later in search. Google Keep makes it easy to capture a thought or list for yourself, and share it with friends and family. Quickly filter and search for notes by color and other attributes like lists with the label "To-dos", audio notes with reminders or just see shared notes. Find what you're looking for even faster, and let Keep do the remembering for you.